August 16, 2013 (Cleveland, OH) – Symphonic gothic horror musicians MIDNIGHT SYNDICATE have just released the AXE GIANT THE WRATH OF PAUL BUNYAN: ORIGINAL MOTION PICTURE SOUNDTRACK. The album, produced by Midnight Syndicate, features highlights from the movie score composed by EDWARD DOUGLAS along with The Ballad of Paul Bunyan performed by HICK’RY HAWKINS. The CD is available now through the band’s website, as well as iTunes and Amazon.com. 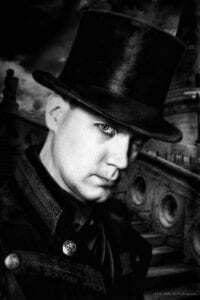 Midnight Syndicate’s music has become integral to setting a powerful mood at top-rated haunted attractions and amusement parks as well as at costume shops, gaming and Halloween parties and Halloween-themed cruises from Siberia and Hong Kong, to Europe and the United States. The duo has released 15 studio albums since 1997, and Douglas and Goszka’s original, work also been used at Hugh Hefner’s Halloween parties, on episodes of The Barbara Walters Special and in the drive-in film The Rage, Universal Studio’s Horror Nights XVIII as well as by Monday Night Football and by artists Insane Clown Posse, Three Six Mafia, Twiztid and The Misfits. In 2010, Midnight Syndicate released a full-length horror film called The Dead Matter, directed, scored and co-produced by Douglas alongside Robert Kurtzman (From Dusk Till Dawn, co-founder, KNB EFX) and Gary Jones (Xena, Boogeyman 3). Midnight Syndicate continues to pursue its quest to use instrumental music to tell explicit stories full of tension, twists and turns. Most recently, the band completed the score to the grindhouse thriller Axe Giant: The Wrath of Paul Bunyan. In summer, 2013, Midnight Syndicate released the soundtrack to that film along with Monsters of Legend, a tribute to the classic Universal, Hammer and Euro horror films that gave birth to horror cinema.